I could tell on Monday night that I was starting to get sick, so I went to bed early, hoping to wake up and feel better. When that didn’t happen, I decided to make some nutritious and delicious comfort food to cure what ailed me. This soup was exactly what the doctor ordered. This soup tastes like it was a whole lot of work, when in fact it is almost totally hands off. 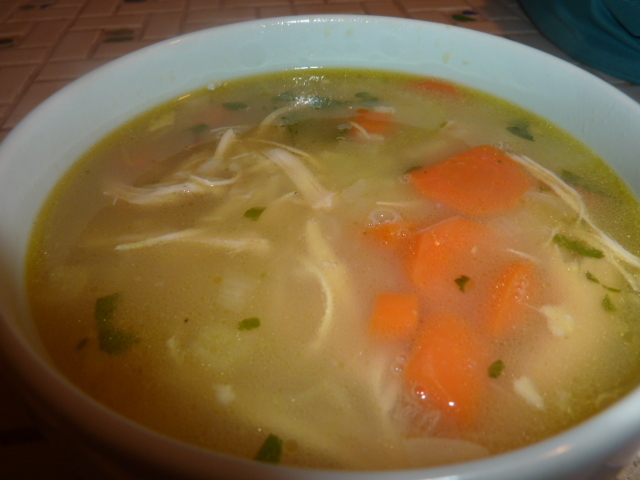 However, it has hours of home cooked flavor from the homemade bone broth and vegetable-poached chicken. The rice is filling and adds a nice creamy texture to the soup. I consider the lemon in both the broth base and as a finishing touch the “secret ingredient” here – it brightens up the whole dish and balances out the sweetness of the carrots. I woke up the next morning feeling greatly improved, thanks in no small part to this healthy and satisfying dish. If you plan to eat this as leftovers, be aware that the rice will soak up a lot of the liquid, and you will either need to add more stock as you reheat or eat a much less soup-y version the next day. Both ways are really satisfying and have all of the same comforting flavors. In a large stock pot, combine all ingredients. Add water to cover all ingredients. Over medium heat, bring to a boil. Reduce heat to a simmer and simmer for 4 hours, skimming fat occasionally, until darkened in color and chicken is cooked through. Carefully remove chicken with a pair of tongs and set aside. Strain, discarding remaining ingredients. Carefully remove chicken from the broth above and set aside to cool. Once cool, using forks or your fingers, shred chicken into bite size pieces, both white and dark meat, discarding bones, skin, giblets, and fat. In a medium Dutch oven, melt butter over medium heat. Add onion, celery, and carrots and season with salt and pepper to taste. Cook until onion is translucent and celery begins to become tender. Add shredded chicken, parsley, and rice. Bring stock to a simmer. Cover and simmer for 20-25 minutes until rice is tender. Taste for seasonings, adjusting as necessary. Serve immediately, with a squeeze of lemon over each bowl.